The Exclusive OR gate or EX-OR gate is useful as a controlled NOT gate, if one input is a control signal the EX-OR gate becomes either a buffer or NOT gate for the other input according to control. This feature is used in driving LCD displays. The CD40xx CMOS family can work at even 3V-9V-12V DC and consume low power. The speed is not as fast as 74xx TTL family. It is good for simple portable battery powered circuits. The 74HCTxx series is good for low power and high speed but will work at 5V. When you have problems interfacing CMOS and TTL use 74HCTxx family. 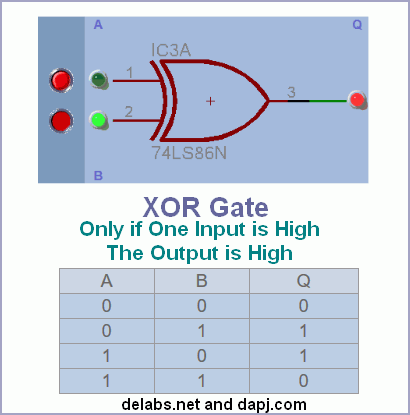 This gate EX-ORs the two inputs A and B, The Output is high only if either A or B is high, output goes low if both inputs are high or low. There may be a EX-OR gate with many inputs, if the number of inputs that are high is a odd number then output will be high, for even number of high inputs output will be low. You could also make a Special XOR or XOR+ in CPLD where many inputs are present, only one goes high the output goes high, any other combination output is low. Toggle the red buttons above to apply a 'high' or 'low' to inputs A and B and watch the output Q.
Interactive Tutor for Learning Digital Logic, Like NOT, AND, OR and XOR.